Tuesday to Saturday between 10am and 5pm. Knit one… is a small and gorgeous wool shop in the centre of Dolgellau, an old Welsh town long associated with the wool industry. 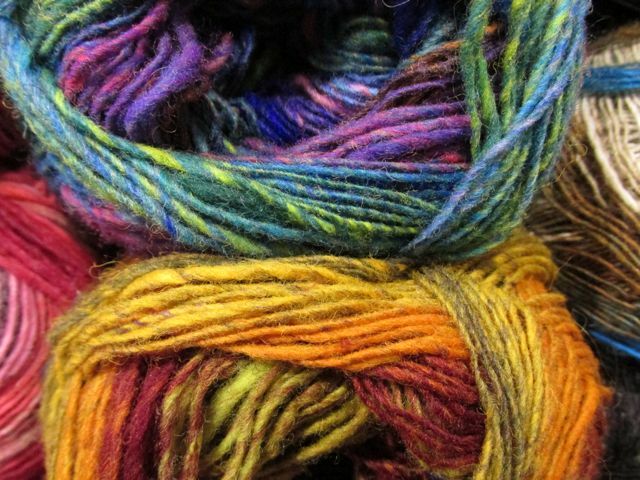 We stock all sorts of yarn, from Rowan’s super chunky Big Wool to the very finest laceweight. There is a good selection of British yarns, too. We aim to cover all woolly needs – and budgets. Scroll down to the bottom and you’ll find all our contact details, but at the risk of repetition we can be called on 01341 422194 during our usual business hours – Tuesday to Saturday, 10am to 5pm. 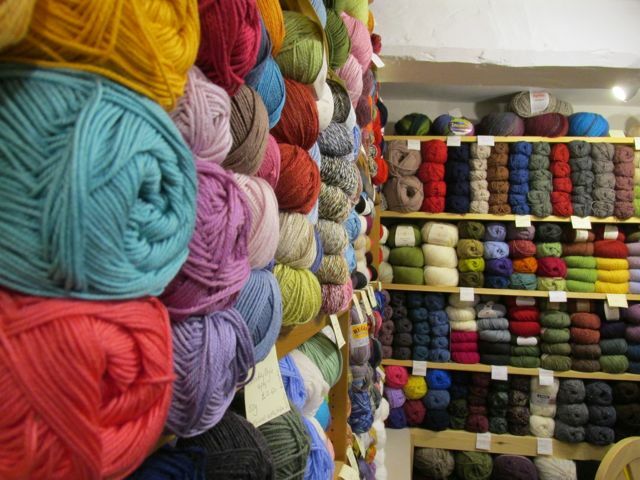 The shop is an inspiring, tempting and welcoming haven for anyone who knits, crochets, felts or who just loves yarn, fibre, colour and texture. 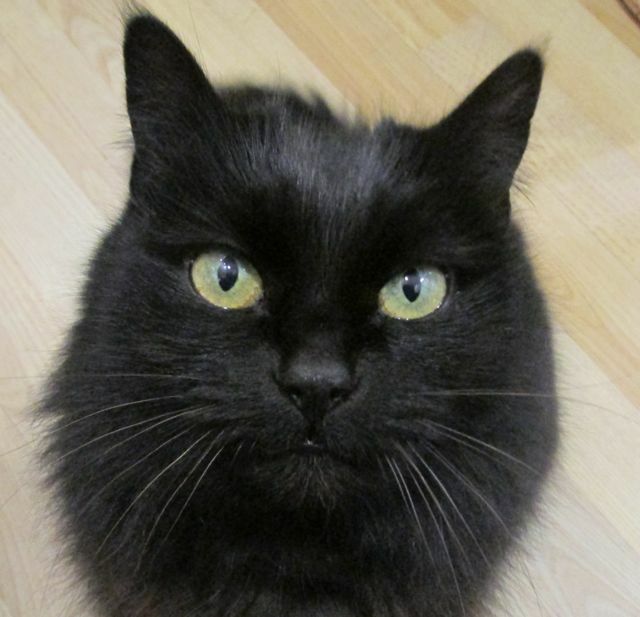 Or just for someone who admires Bramble, the wool shop cat (she has her fans who visit and, indeed, her own twitter account – @WoolShopCat of course – where she laments the shortcoming of her Humans on the cat treat front, begs shamelessly for more, and occasionally mentions wool). Be reassured. She is very well behaved around wool; policing is constant but uneccessary! The shop is also on Facebook, where you will find frequent updates on everything from the local knit and natter group, held in a very good wine bar in the town, to the latest yarns, promotions and any sales that might be going on. There are more details of some the brands we sell on the yarns page, or keep up with the blog – the link is on the top menu, or just click here – as exciting new additions often crop up there, as well as on Facebook. It’s not just wool, of course. There are patterns and books, and anything else you might need – knitting needles, crochet hooks, buttons, ribbon and other notions. We also offer cheerful and friendly customer service, and can help sort out your knitting dilemmas. Bramble may, or may not, appear. Occasionally she is deliberately brought, but usually under protest. but of wool, not felines! A charming friendly shop with brilliant staff having lots of knowledge and knitting skills and with a willingness to help. How kind of you to say such nice things about us. We do try to help if we can. Thank you. I found this shop as staying in Dolgellau. What a beautiful shop. The lady, Angharad, was so helpful and inspiring. Really have to go back. How kind of you to say such nice things about our shop. We are very proud to be here doing what we do. 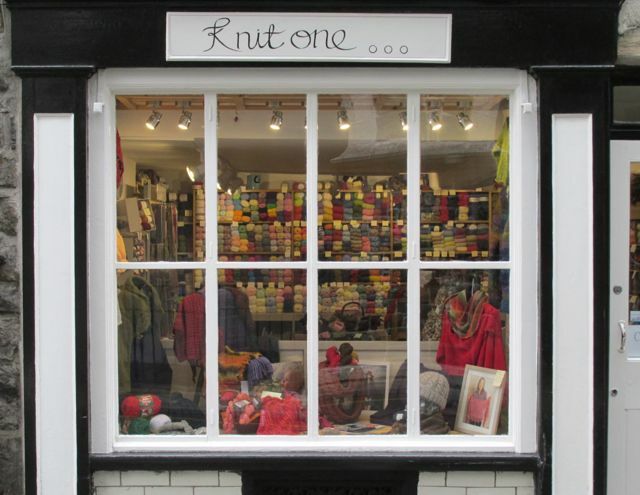 Knit one is a fabulous shop with beautiful yarns, patterns, books and advice and are always happy to show you how to do different stitches or explain patterns if you are a little bit lost. 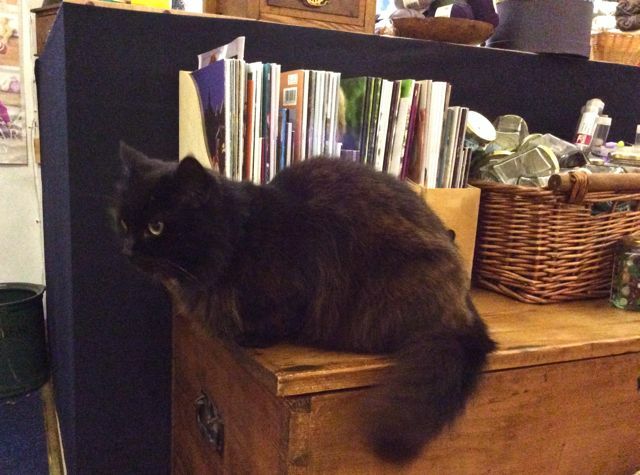 Thank you for saying such lovely things about our shop, we very much enjoy meeting new people and helping where we can (Bramble the wool shop cat would expect nothing less of us). Thanks for your help on Wednesday this week, in with a local Dol who doesn’t have the wool thing I do!! Love the llama I bought, strokable> Will come into spend time with you next time before I go and visit her in Lion Street. Thanks again and it turns out I work with afriend of yours daughter Kath McGuire – small world. Wow, what a small world indeed! Please say hi to Kath for me, I was only chatting to her Mum earlier before you came in. It was a pleasure to help you and look forward to seeing you again, Angharad. Hi Elaine, thank you for saying such lovely things about our shop. We love to welcome visitors and look forward to seeing you next year … cups of tea are forthcoming too for the thirsty :). Enjoy your sock knitting adventure – a word of warning however, Knitting socks can be addictive! Thank you so much for all your help the other week when i popped in with my wool problem – i had brought pretty pink wool which had a pattern in to knit a coat for a baby being a novice i wasn’t able to match the pattern, front back and on sleeves. i came away with more wool (baby jumper nearly finished now) and an idea for using the original wool as a blanket including instructions on how to knit without the expense of a pattern, i was so grateful to you for your time and help. I will definitely be popping back when next in Barmouth and i will let you know via facebook how the two tone blanket turns out. since visiting your shop i have renewed my love of knitting. Dear Joy, thank you so much for writing such a lovely series of comments about our little shop. We love to help people and are delighted you have managed to use the wool that didn’t work out for the jacket you started. Also we are so pleased to hear your love of knitting as been reignited! Knitting is so comforting for both knitter and recipient. I look forward to seeing you again when you are next in Barmouth. Sorry I took so long to respond – my internet connection was down!